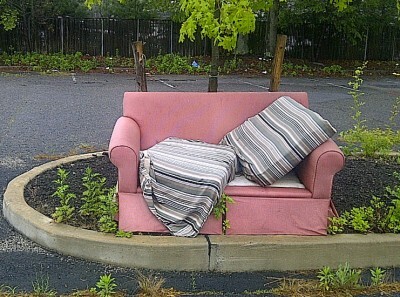 Residential Junk Removal service by 1-855-F'IN-JUNK: This old couch has seen better days. 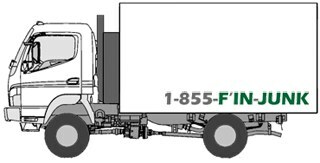 1-855-F'IN-JUNK offers residential junk removal services for homeowners and apartment renters. We pick up any garbage, trash, and recyclables that you may have around the house, including large items like appliances and furniture. There's no need to drag garbage bags out to the curb or carry that old couch downstairs and out the door - We're happy to come in and do all the lifting at no extra charge! Our trained, helpful team of junk removal professionals gets the junk out quickly and safely and sweeps the area before leaving, so you're left with zero mess. How much will Home Junk Removal Cost? Junk removal prices are determined by volume. If you know how much household waste and recycling material you have, you can get a ballpark estimate by checking our junk removal price chart. Scheduling a household trash or recycling pickup is easy, and only takes a minute!